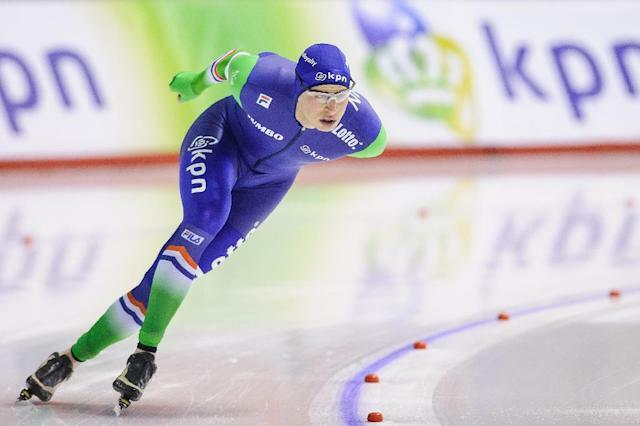 Calgary (Canada) (AFP) - Dutch speed skater Sven Kramer captured his seventh All-Around world title on Sunday, capping his weekend with a triumph in the 10,000 meters. Titles in 2007, 2008, 2009, 2010, 2012 and 2013 had already given the two-time 5,000m Olympic champion the most All-Around world triumphs in history. He finished the four races of the 2015 championships on the Olympic oval in Calgary with 146.509 points, with Russia's Denis Yuskov second with 146.934 and Norway's Sverre Lunde Pedersen third on 147.182. Kramer had led after the opening day on Saturday, when he won the 5,000m and finished 10th in the 500m. He benefitted from the early crash in the 500m of compatriot and defending champion Koen Verweij. On Sunday, Kramer tied for third in the 1,500m before his closing 10,000m victory. On the women's side, Czech Martina Sablikova added a third title to the all-around crowns she earned in 2009 and 2010. With wins in the 3,000m and 5,000m, Sablikova denied the Netherlands' Ireen Wust a fifth straight all-around world title. Sablikova finished with 157.717 points, while Wust, a double gold medallist at the Sochi Olympics, was second with 1:59.278. Norway's Ida Njatun, fastest in the 1,500m on Sunday, was third overall with 159.795 points.